Windscribe VPN review 2019 | Is the Free Version Good Enough? Windscribe boasts fast speeds, can unblock Netflix, and is suitable for torrenting. The mobile app is limited and those looking for prompt support might miss a true live chat feature. Windscribe is a relatively new Canadian-based provider claiming to be “the best VPN on the market.” With fewer servers than many competitors, you might not expect this provider to perform all that brilliantly. We’ve been testing it out so that we can give you all the information you need to decide if Windscribe might be the best VPN for you. Let’s take a look at how it fared! 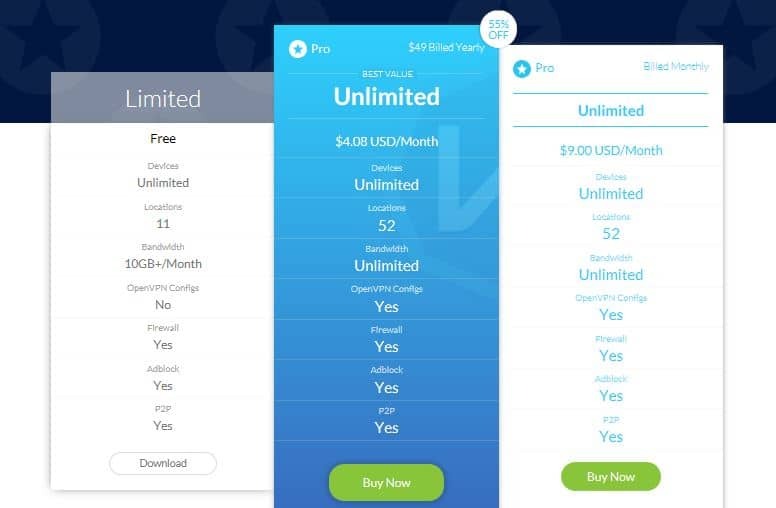 Windscribe has a free offering and while it’s not bad for a no-cost VPN, it is still pretty limited compared to premium options. You have access to servers in just 11 countries and get 10GB of bandwidth to play with per month. There is no OpenVPN configuration but you do get protection from IP address leaks and ad-blocking. P2P is allowed, although this may not be all that useful with only 10GB of bandwidth per month. Aside from the free version, a single paid plan is available for which you can be billed monthly or annually. The monthly option will cost $9 per month but the annual plan comes with a steep discount of 55% making it $4.08 per month. These are pretty average prices for monthly and annual plans. However, many providers go a step further and advertise even bigger discounts on two or three-year plans, but we don’t see a similar offering from Windscribe. When you do go to pay, you’ll find ample acceptable payment options including Bitpay, PayPal, PaymentWall, and most major credit cards. The ability to pay with bitcoin will be welcomed by privacy-conscious users. If you’re wondering about a free trial, there is a three-day money-back guarantee. This is one of the stingiest we’ve seen, especially when you consider many providers offer 14-day and even 30-day guarantees. One thing that helps offset this is the fact that an account will allow you to connect to an unlimited number of devices. This is rare as most providers cap the number at two to six per account. We’ve seen other new providers offer an unlimited number of connections, so this may be a tactic to help gain an early following. We wouldn’t be surprised if a cap comes into effect down the road. 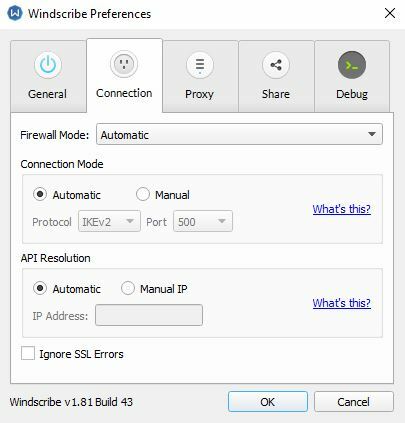 Windscribe apps are available for Windows, MacOS, iOS, and Android, and the VPN can be configured for Linux and certain routers. There are browser extensions for Chrome, Firefox, and Opera, but these are HTTPS proxies that don’t offer the same security as a VPN. Once signed up, you’ll have access to a network of more than 600 servers in more than 50 countries. The paid plan gives you unlimited bandwidth and allows P2P, so torrenting won’t be an issue. Windscribe is competitive on the security front with 256-bit AES encryption and perfect forward secrecy. It also boasts a firewall which should protect against any kind of leak, including DNS and IPv6. The firewall reportedly offers a better alternative to a kill switch, so no kill switch is included. A number of protocols are available including OpenVPN, IKEv2 and SOCKS, and Stealth (a version of TCP run over OpenVPN). The browser extensions can be used in combination with the VPN and offer a suite of additional privacy options, including ad-blocking and “anti-social” settings. Once you’ve got a Windscribe account set up, downloading and installing the apps is very straightforward. Windscribe describes its apps as “minimalist clients,” which may be welcome news for beginners who aren’t fans of a lot of bells and whistles. For this review, we’ve tried out the Windows and iOS apps. 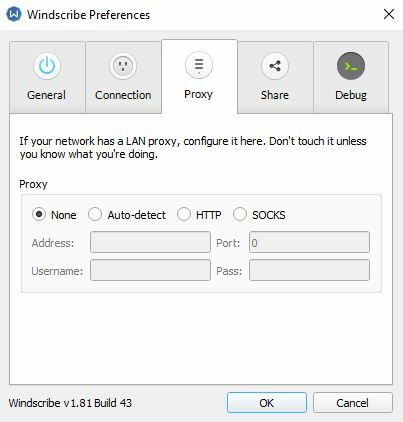 When you’re logged into the desktop client, you’ll see that indeed the Windscribe app is very compact. The main screen shows you your current IP, whether or not the VPN is connected, and whether or not the firewall is on. The latter is Windscribe’s version of a kill switch, and will kill the internet connection if the VPN connection is lost. You can easily toggle it on or off from this main screen, which is a neat feature not typically supported in other VPN clients. Clicking the location dropdown will open up the server list below the app. You can select a server based on country and be automatically connected to the optimal server for that location. If you want to be more specific, you can click the arrow to the right of the country name and view servers based on city, each server having its own witty name. Once you’re connected, the whole app will change color from gray to bright blue. This means it’s always easy to tell when your connection is successful or if you have been disconnected. To access the settings menu, you click the menu icon in the upper left-hand corner and select Preferences. You then have five tabs to choose from. In the General screen, you’ll see simple startup settings and the option to change languages (there are dozens available). Over in the Connection tab, you can adjust the firewall settings and change your protocol. There is also a spot to enter a manual IP address. This can be requested from Windscribe in case you’re getting an API connectivity error. This might happen when DNS requests are being blocked, for example by country or business firewalls. The next tab,labeled Proxy, is where you configure a LAN proxy if needed. Then you have the Share tab where you can configure your own wifi hotspot or create your own proxy server. Finally, the Debug tab has options for sending or viewing logs and disabling IPv6. The mobile application is sleek and well-designed albeit very limited. The main screen has a similar look to that of the desktop version, with a power button and server location dropdown menu. Once connected, the interface will turn bright blue. Clicking the menu icon and selecting Preferences will take you to your settings. It should really be labeled ‘Preference’ as there’s only one option here and that’s to add a manual API IP address. The app will probably be fine for beginners but advanced users might miss additional options. Windscribe offers a relatively small network of servers comprising over 600 in more than 50 countries. Many of these are located in the US, which is great for those looking to unblock US streaming services. Switching between servers doesn’t require disconnecting first so you can do so with just one click. You can select your server based on country alone or the specific city. All servers are suitable for use with P2P filesharing unless they are marked otherwise (a P2P icon with a strike through it). We tested some of Windscribe’s servers for browsing, streaming, playing online games, and downloading files. Overall, the experience was great. Connecting to and switching servers was quick and painless, and we didn’t experience any dropped connection. We played online games with no issues and streamed 1080p through various servers with no buffering. When running speed tests we aim to be as empirical as possible. We use a test server in Canada and connect to each provider’s servers in the US, UK, Hong Kong, Australia, and Germany. For each location, a test file (50MB) is downloaded from a server in the US four times per day at six-hour intervals. We note the average download speed for each test and display the aggregate data. In the Simple tab of the chart below shows how Windscribe compares to other VPN services we’ve tested purely on the basis of median download speed. As you can see, Windscribe performs well with speeds around the middle of the pack. A more detailed version of our results can be seen in the Detailed tab. Here, you can see that the spread in results for Windscribe is fairly tight compared to many competitors. This indicates a fairly reliable speed range and means that you’ll likely know what kind of speeds to expect once you’ve been using the service for a while. It’s important to note that these tests aren’t definitive and can only serve as a general indication of the performance you might see. The inherent volatility of the internet adds a significant factor of randomness. What’s more, you’ll likely see longer wait times with a slow connection, and perhaps smaller or larger discrepancies. Does Windscribe VPN unblock Netflix? Windscribe prides itself on being able to provide access to geo-restricted content such as that provided by Netflix. With Netflix cracking down on the use of VPNs in order to view geo-locked shows and movies, it can be difficult to find providers that can reliably bypass the proxy error. We tested Windscribe’s ability to access US Netflix. The New York server we tried resulted in an error, but when we switched to a Los Angeles server, it worked seamlessly. Similarly, we were able to use a London server to unblock Netflix UK. Even though it wasn’t much trouble to access Netflix via this method, Windscribe has another option. You can get access to US or UK Netflix through dedicated ‘Windflix’ servers. In the server dropdown, just select either WINDFLIX US or WINDFLIX UK from the list and you’re good to go. We were successful in unblocking the US and UK Netflix libraries through these servers respectively. Aside from Netflix, we tested a few other streaming services with mixed results. A London server unblocked ITV Hub and All 4, but not BBC iPlayer. The Windflix UK option couldn’t provide access to BBC iPlayer, either. Amazon Prime Video was accessible through a regular UK server for the British content, and through the Windflix US option for the American content. 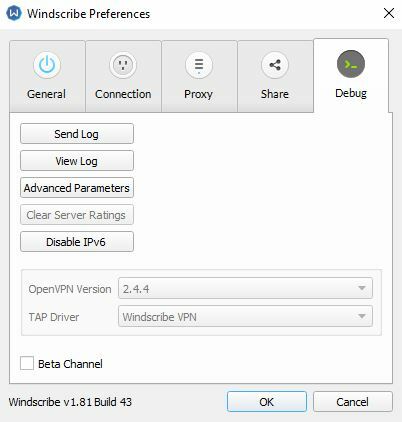 Does Windscribe VPN work in China? With China’s Great Firewall blocking popular sites including Facebook, Google, and YouTube, many residents and travelers are turning to VPNs to access this restricted content. Unfortunately, many VPNs are blocked in China too, and there’s a dwindling list of providers that still work there. Thankfully, according to users on a Windscribe subreddit, many are having success with this service in China. Just bear in mind that setting it up to actually work might not be straightforward. Plus, even if the VPN works in China, the website itself might be blocked, meaning little to no access to general support and troubleshooting assistance. So if you do plan on using the service in China, it’s probably worth becoming familiar with the setup and potential issues before you travel. Windscribe is headquartered in Canada, one of the Five Eyes countries. This means it could be subject to mass government surveillance by other countries. 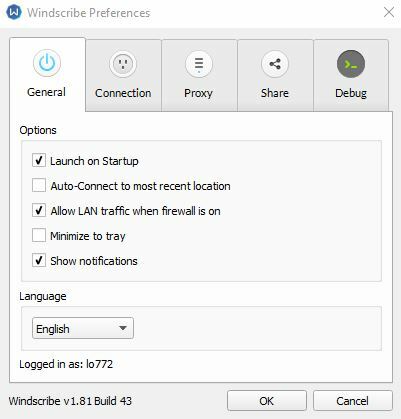 Thankfully, Windscribe not only hides your activity from your ISP and anyone else who might be snooping, but it also maintains a strict no-logs policy. This provider doesn’t keep any traffic logs and connection logs are kept to a bare minimum. “We store total amount of bandwidth your account has consumed in a 1 month period, which is reset every month on the day of your registration.” It also stores a timestamp of the last activity associated with an account to detect inactive accounts. However, this is linked to an account and not an IP address. Windscribe’s security features are comparable to those of some top providers we’ve examined in the past. It uses 256-bit AES encryption with SHA512 authentication, in conjunction with 4,096-bit RSA keys and backed by perfect forward secrecy. Protocol options include OpenVPN, IKEv2, SOCKS, UDP, TCP, and Stealth. The latter is a version of TCP that might be useful in China. According to Windscribe, “each VPN server has a recursive DNS server running on it, which means it does all the DNS resolution for you.” This means you should never have to worry about DNS leaks. IPv6 leak protection is also included and is enabled by default. This can be disabled in the Preferences>Debug tab. When it comes to a kill switch, Windscribe claims that its “firewall” is superior to the kill switch feature offered by most VPNs. It states that it “blocks all connectivity outside of the tunnel to ensure there is zero chance of any kind of leak, including but not limited to DNS leaks, IPv6 leaks, WebRTC leaks, etc.” The firewall is enabled by default, but this can be altered in the Preferences>Connection tab. It can also be simply toggled off and on in the main screen. One more added security feature is the ability to create a “double hop” by using the VPN client in combination with the browser extension. The idea is to connect to two different locations — one through the VPN and one through the browser extension. This serves to help privacy and anonymity by preventing a correlation attack on a Windscribe server. As a bonus, the browser extensions block ads and remove all trackers, including social widgets. 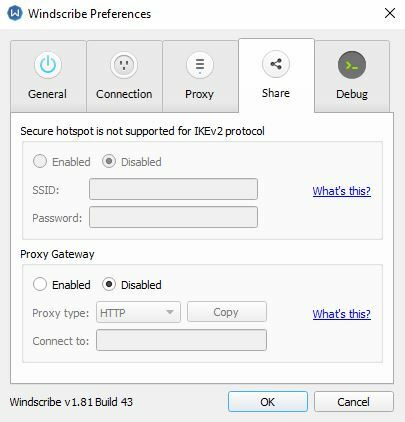 If you’re in need of any help setting up or using Windscribe, you have a few options for support. Clicking the Support tab on the website or selecting Help Me! from within the app will take you to the main support hub. Here, you’ll find a Self Help section including Setup Guides, FAQs, and a Knowledge Base. As far as FAQ sections go, we found Windscribe’s to be pretty thorough and upfront whereas many are limited and/or vague. Moving on to Technical Support, you have three options: Subreddit, Talk to Garry, and Submit ticket. Talk to Garry is actually the ‘live chat’ option that you can alternatively access by clicking the green speech bubble icon in the lower left-hand corner of the website. Surprisingly, this is actually an automated bot that seems to give a predetermined response based on keywords present in your question. This may be okay for some users, but it’s essentially the same as having a search function in an FAQ section or knowledgebase. After asking the same question several times and getting a few different confusing responses, we had the option to “escalate to Human.” Instead of taking us to an actual live chat rep, it directed us to submit a ticket through email. We got a response to one ticket query in around six hours but another took a lot longer. The Talk to Garry option seems a bit pointless and might be frustrating for some users. Hopefully, as this provider grows, it will see value in providing a real live chat option. Windscribe has a very solid offering suitable for beginners and seasoned VPN users alike. It packs most of the features you might be looking for including strong security, ability to unblock sites like Netflix, fast speeds, and unlimited bandwidth. Whether you want to stream, torrent, or browse securely, Windscribe pretty much has you covered. Highlights include unlimited simultaneous connections and dedicated streaming servers for Netflix US and UK. Downsides include the lack of 24/7 live customer support and the limited mobile application. Windscribe is by far th best vpn i’ve ever used and I’m so glad I came across it! No matter where you search it, you’ll always see positive reviews about windscribe. It’s been fantastic on my laptop, tablet and mobile phone. One account can cover multiple devices and browsers, which means you save big time! The security features are superb making it the best VPN to have based on security alone. Windscribe is just great. I’ve used over a dozen different VPNs before, and every one had a flaw: slow speeds, crashing clients, terrible support, no Netflix, doesn’t support all devices, etc. None of these things are a problem with Windscribe. Im getting 95% of my normal speed, I had the app ON and connected for the last 3 months with zero problems. Literally zero. I forgot what their app even looks like. UK Netflix works perfectly, and they support all devcies that I have (windows computer, iphone, QNAP nas and router). A++++ service. Price is great too. Windscribe is by far my favorite VPN. It works so smoothly without interruptions of buffering problems when watching videos while connected to other locations. The speeds are very good and I have no problem uploading or downloading whilst connected to Windscribe. I would definitely recommend investing in the Pro Plan as it allows your unlimited data, something that is needed if you’re a heavy internet user. The dedicated streaming servers for Netflix US and UK are the bomb! Probably one of the main reasons why I use windscribe, apart from its use to block ads and trackers. It’s great for security and saves you having to install tons of apps. Worth checking out especially as they have a free plan available. Windscribe has been a very reliable VPN which I have been using for 7 months now. The features provided are reliable while the speeds are very steady despite connecting to locations furthest from where you are actually based. It’s really handy to have specific features all in one app, saves the needs to download multiple one’s. It’s also great to use while on the go as you can also use it on your mobile device or tablet. 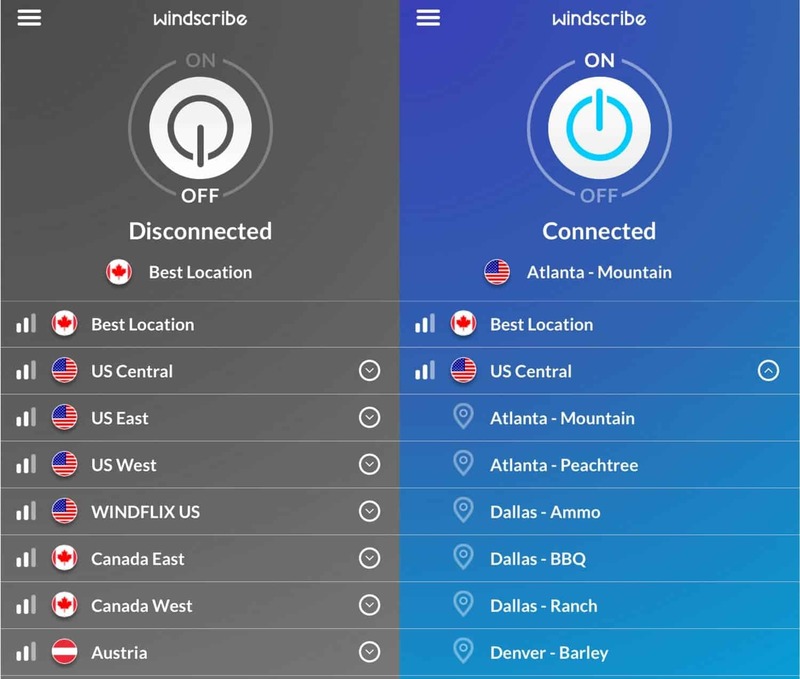 Windscirbe is definitely the vpn everyone needs to be trying out. I could not recommend it enough simply basing it on the overall speed factor and high level of security. Winscribe has come far since it first started up which is now more than 2 years ago. It’s been a great VPN that has maintained its speeds and has continue to provide good updates that accommodate their customer’s needs. The security features have improved as well as easily being able to access it no matter your browser or device. I’ve also noticed customer support is getting better and the response time has improved which had been an issue for many before. Overall, if Windscribe continues to keep up at the pace they’re currently at then I seem them coming out as one of the best VPN providers. Great for everyday use and when on the go. The geo restricted feature is by far a fav of mine and i’ve loved using it while on the go. Very useful to have for both personal and business use. Also love the multiple device feature, making it worth making the upgrade. It’s a really easy to use and is a great VPN. The features are great and the speeds are even better. One of my favorite apps! Windscribe is so much better than when it first started. Loving the updates and maintenance on the VPN. Have noticed a big difference in the speeds and how the features function. Worth the extra $$ compared to the cheaper ones. So much better than various other VPN’s that simply try to ‘steal’ your money! Speeds have constantly improved with updates, the features are strong and very useful, plus the customer service has improved! Worth what you’re paying for making it a win-win situation! Windscribe has definitely improved over the years which is one of the reasons why I love them! The developers are continuously doing their best to keep their VPN updated and on track. It’s worked great for me in different countries and the Netflix features works like a charm!! Windscribe is definitely the best vpn on the market right now.I have been using it for several months now and never have I experienced a problem with it.They give you the fastest speeds and even give you access to georestricted sites, something I find very handy. It’s really helpful to have everything you need in one place, as it saves you having to downl;oad multiple extensions. I recently upgraded to the pro plan as I needed a bigger data allowance, but for those that want to stick to the free plan, it’s just as good but with limited location servers and a limited date bandwidth. Windscribe has amazing features that makes it excel among the other VPNs. So many great reviews that I can also back up based on my experience with the company over the last year. Specifically love the large selection of locations to connect too with their pro plan, plus the unlimtied date. Works like a charm! Nothing beats a good old VPN that actually gets the job done. A year in and i’m still using Windscribe’s pro plan daily. It’s a great way to safely secure all your details, and unblock certain websites. Would highly recommend it to others, and advise those that are new to windscribe to check out their website so they can make use of all their features. Thank you for this helpful review about windscribe.I’ve been using it for a month now and it’s awesome .No VPN is perfect, but windcribe comes close, especially with their added services and features. Being able to unblock US Netflix is a major plus too especially for those travelling. Great app, great VPN, and overall great performance. A very knowledgeable review about windscribe! I have enrolled in their pro plan which gives me acces to their unlimited features.It’s been great having something to watch my back as I surf the net. If you’re looking for a VPN to makes you feel secure when you’re browsing then Windscribe is just what we’re all looking for. I have read many reviews about this product and decided i’d try it myself to see if the reviews were turm. Turned out they are! Great connections and features, and very impressed with their high maintenance and contnious updates. Big fan of Windscribe. It’s been great surfing the net saefely with reliable connection speeds and a fantastic selection of locations to connect to. I’m very happy with what I’ve recieved for the reasonable fee, especially when you compare it to many other VPN’s that charge more but provide less. Windscribe will defiently soar high and I believe it won’t be long before they become (if they aren’t already) the number one VPN available on the market.